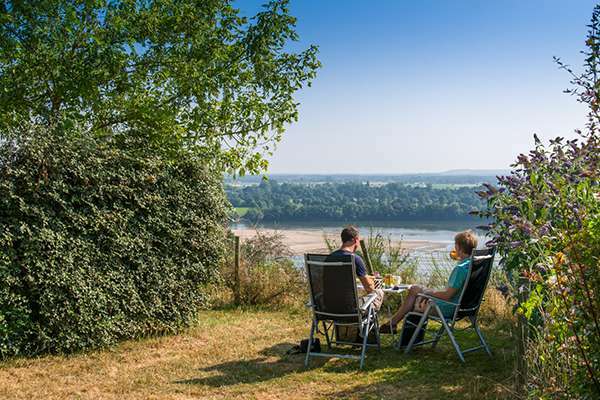 Nestled on the hillside above Saumur with views over the Loire, Huttopia Saumur campsite is a real haven of peace amid the Loire castles. 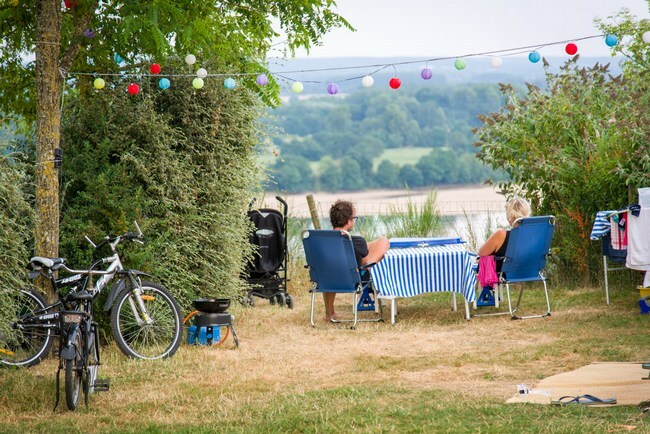 In a lush green setting, Huttopia Saumur campsite boasts views and a magical light over the Loire. 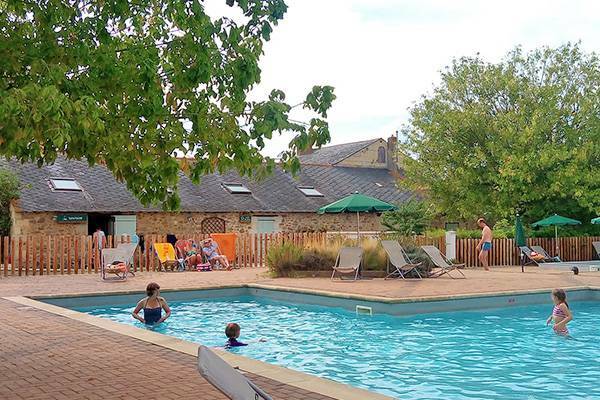 After a day out exploring with your family, enjoy a few lengths in one of the swimming pools. 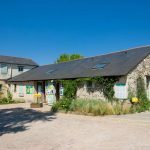 On site you will find a restaurant service, an activity programme for adults and children alike, and washrooms designed for families to make your holidays even easier. 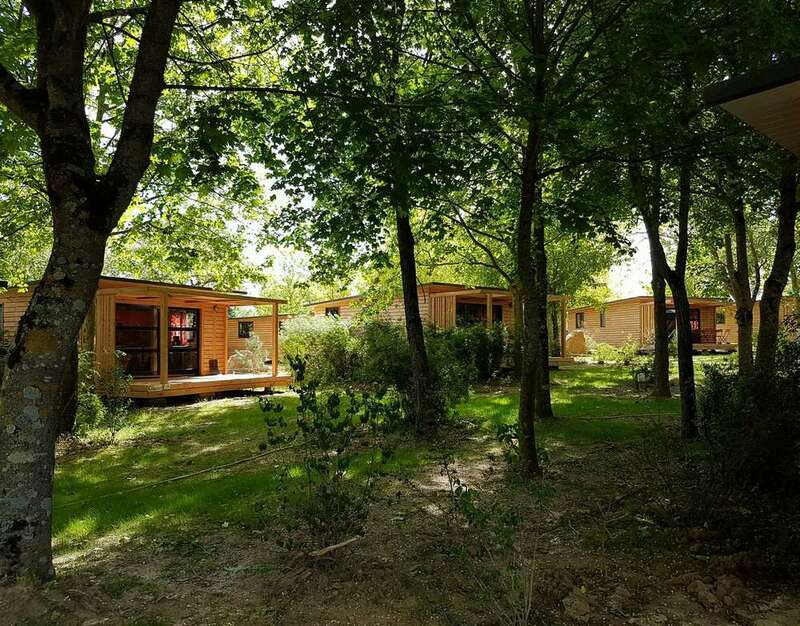 NEW: Huttopia Saumur is having being revamped! 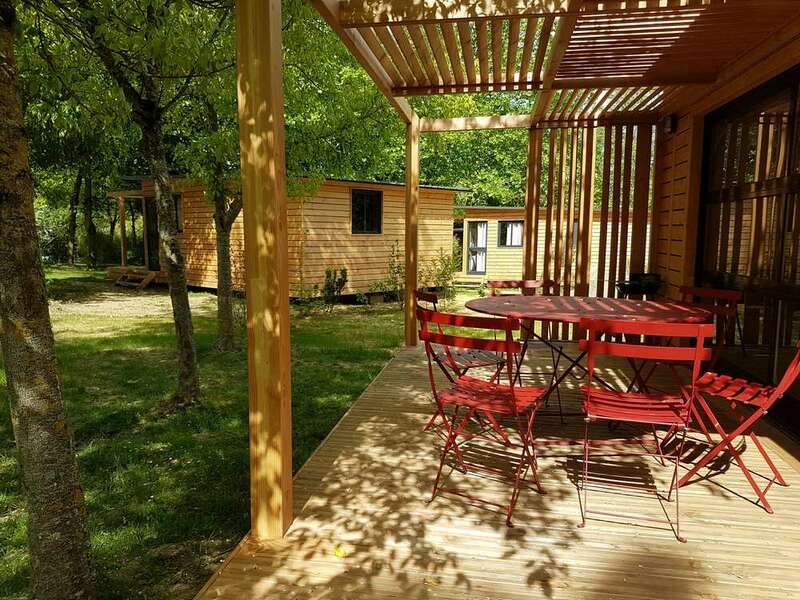 Huttopia Saumur campsite is having a make over so we can welcome you even better: a refurbished reception, a brand new cosy central lodge, and two beautiful new washrooms. 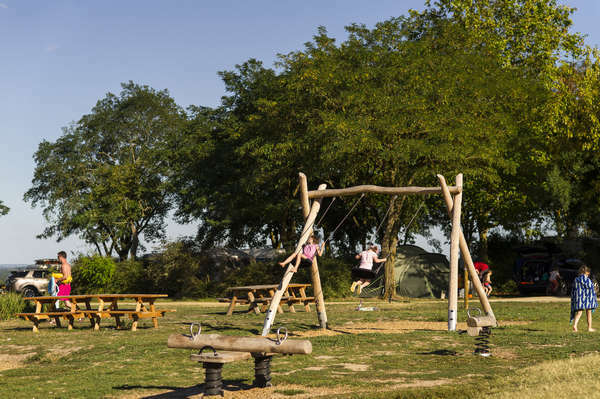 A new playground also awaits your children as well as a volleyball court for all the family. In the heart of a lush natural environment, enjoy a holiday on the water’s edge against a backdrop of UNESCO classified landscapes. 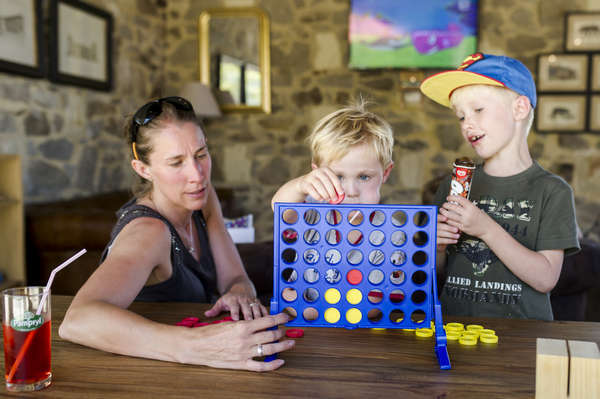 Cave dwellings, castles and famous wineries await you. 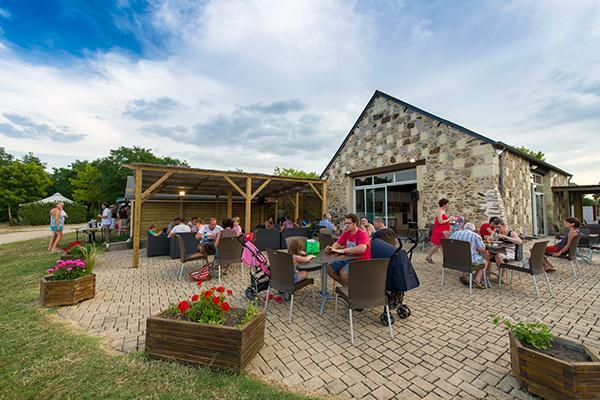 Huttopia Saumur campsite is situated near the wine cellars of Saumur, including the prestigious wineries of Bouvet Ladubay and Ackerman. 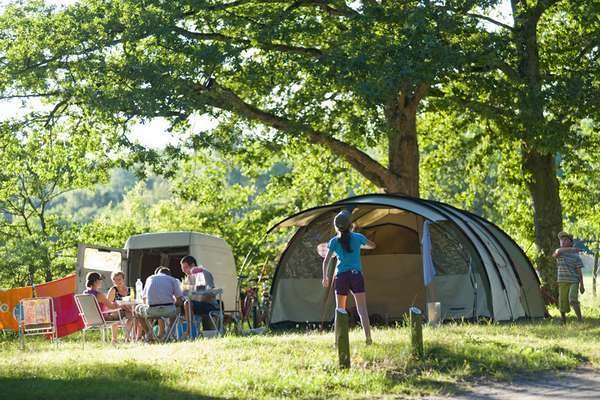 This campsite ensures cyclists are offered premium quality hosting and services that meet their needs. 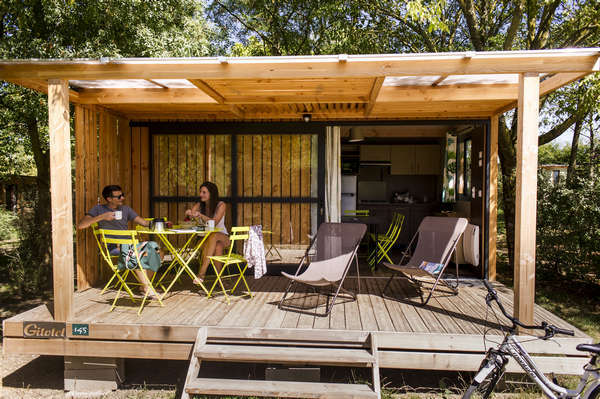 At Huttopia Saumur campsite, everyone can enjoy their own style of holiday! 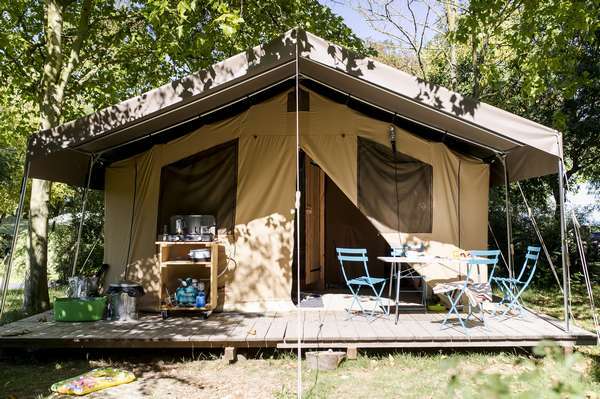 With Wood & Canvas tents, Mobile-Homes, Chalets… Choose a practical stay with all the comforts. New! 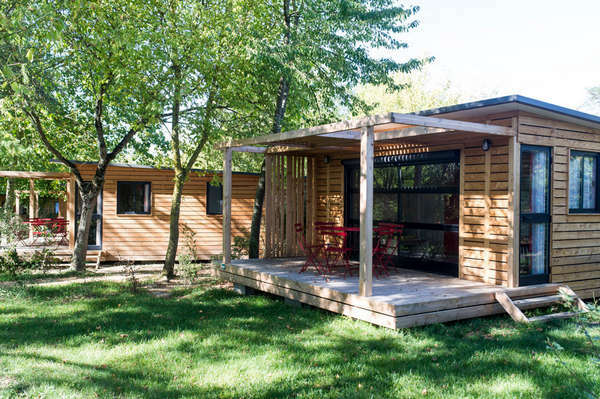 Try out the Evasion or Toronto chalets for up to 6 people. 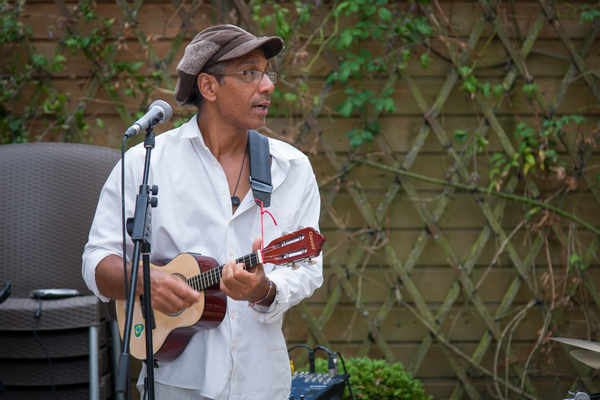 For every nature lover, there is a pitch! 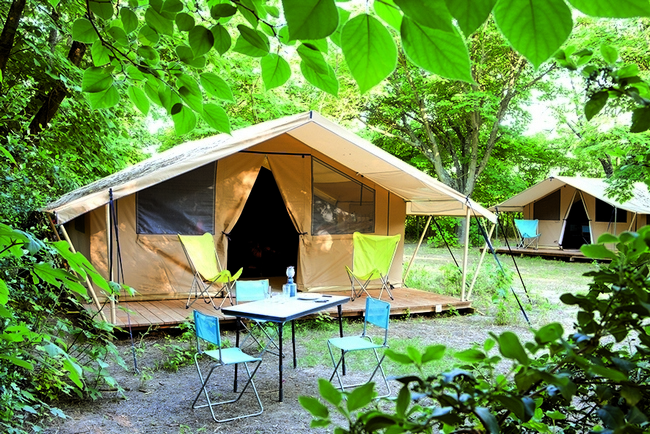 Tents, caravans and motorhomes can set up camp on spacious, shady pitches at Huttopia Saumur. All the pitches there have electricity included. 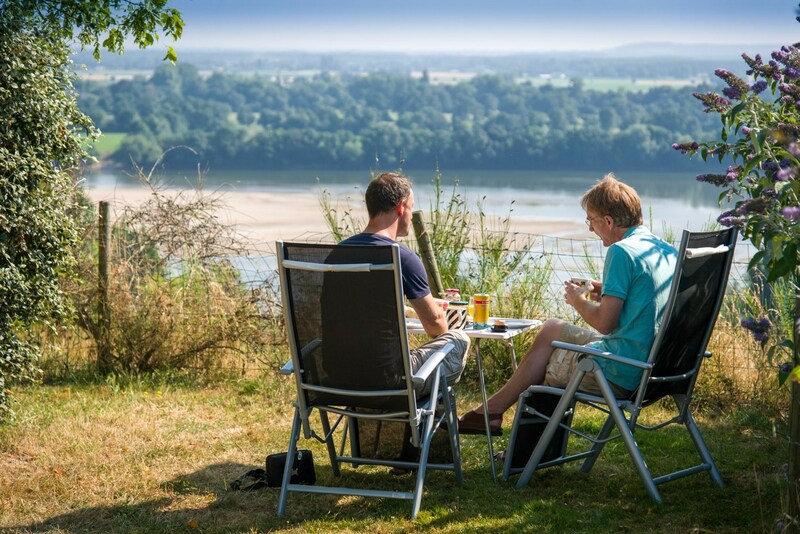 For a complete change of scenery, discover our pitches with a panoramic view over the Loire! Enjoy the comfort of brand new washrooms! 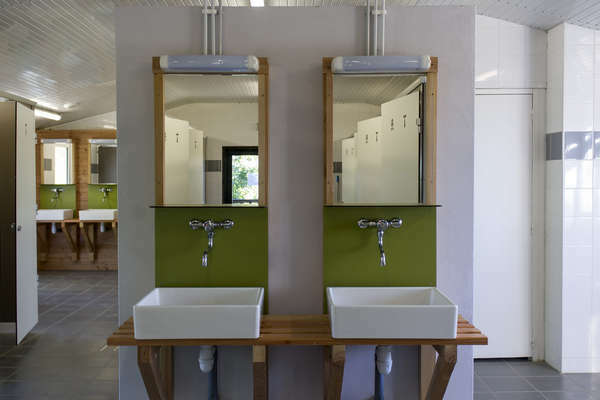 On site: four heated washrooms have been renovated this year with baby and children’s areas, hairdryers, and facilities adapted for people with reduced mobility. > Are you missing tent pegs or guy ropes? Our “campers’ corner” has all the basics!  > Motorhome service area on site. 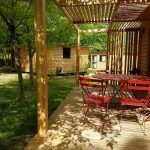 You will love enjoying the sunset from the terrace of Huttopia Saumur campsite after a relaxing break in the nearby pool areas. 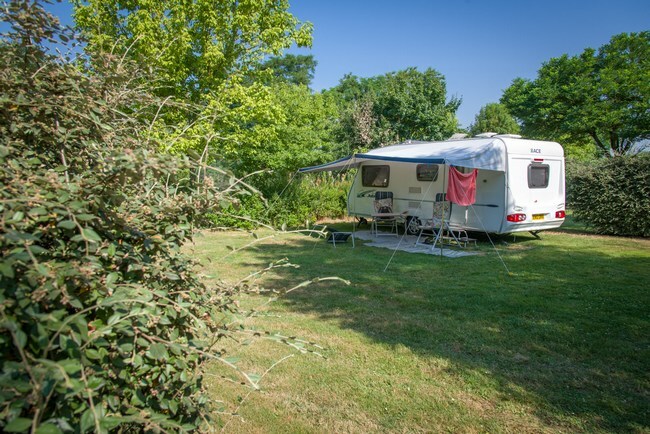 On site, the campsite offers a wide range of other services to make your stay even more enjoyable. 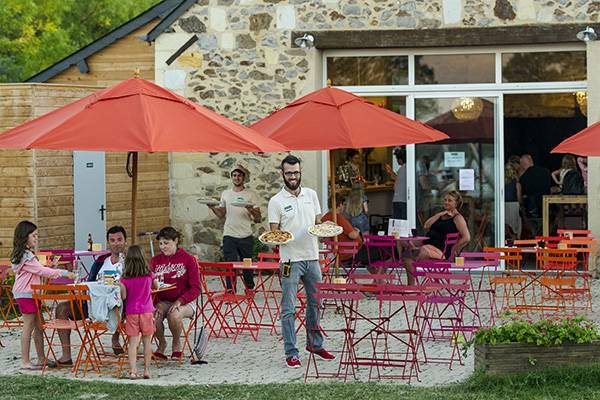 Huttopia Saumur campsite offers a mouthwatering menu! 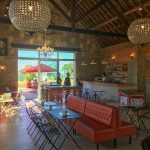 Relax on the terrace with drinks, ice creams or homemade pizzas at dinner time. Our wish? 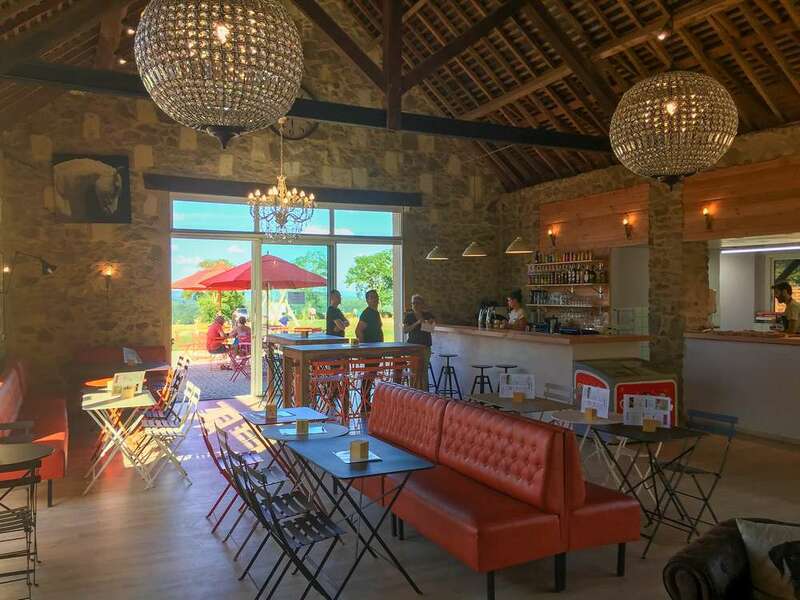 To offer you simple, quality cuisine. The place to get together! You will find books, sofas, board games, and an espresso coffee maker. > Grocery corner: Did you forget to pack salt, milk or any other essential? 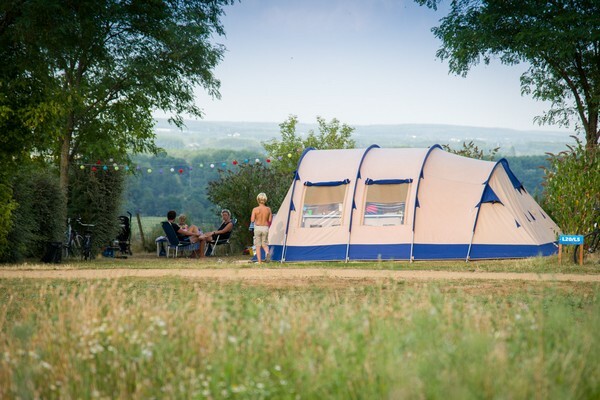 Do you need a camping accessory? 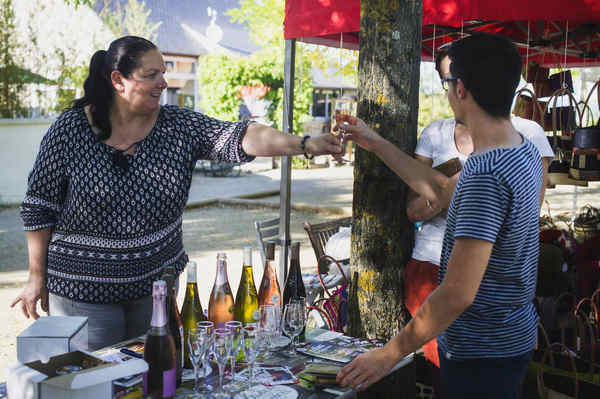 There are also some regional products to be tasted! 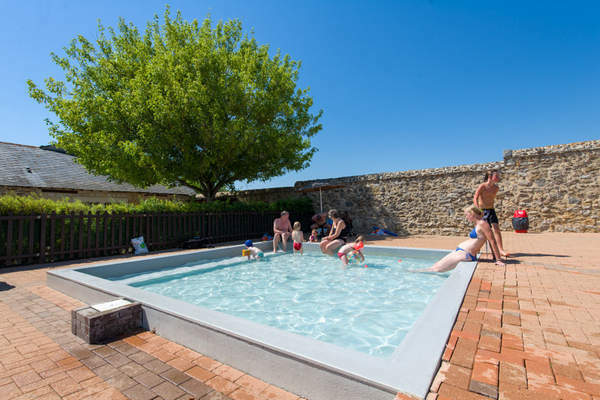 On site, a pool area with 2 swimming pools, one of which is heated, and a children’s pool, so you can enjoy the pleasure of swimming in any season at Huttopia Saumur campsite. 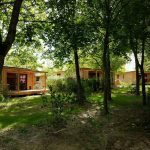 Nature, culture and regional heritage: this is the basis of the activity programme at Huttopia Saumur campsite! 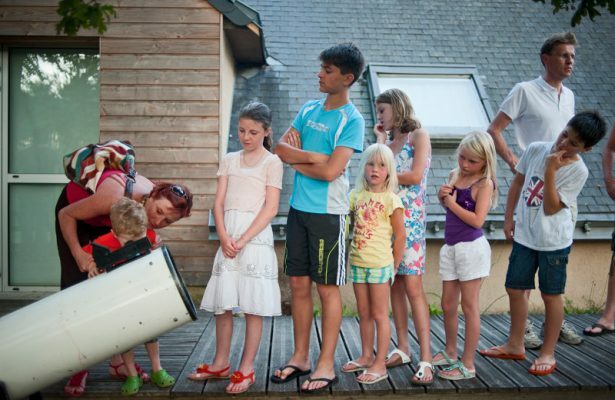 Discover our campers’ favourite activities below, and find out about many others on site! 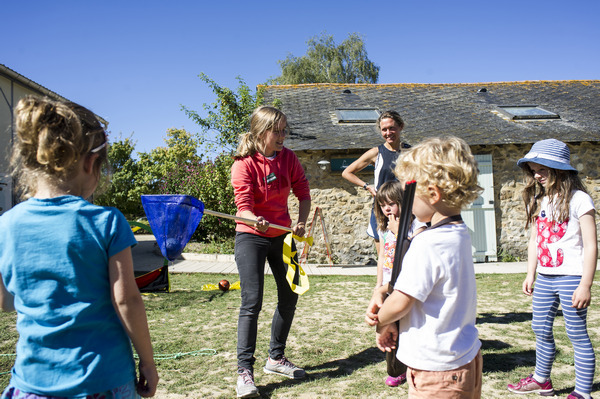 Canoeing and kayaking, pony rides, sports tournaments, medieval-themed activities, yoga, magic shows, wine-tasting, open-air films… and much more besides! 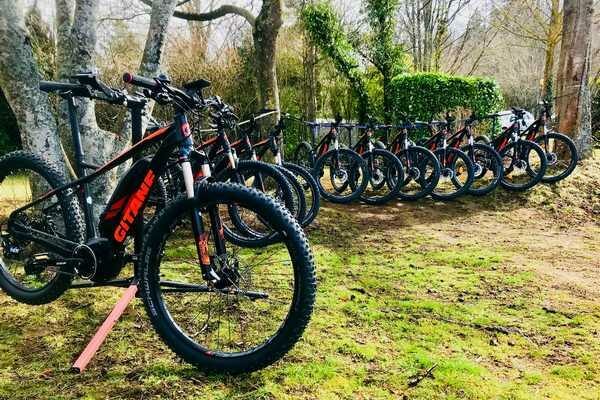 Enjoy true freedom at Huttopia Saumur, with our brand new electric hybrid bikes, available for hire (per half day or full day) throughout the season. 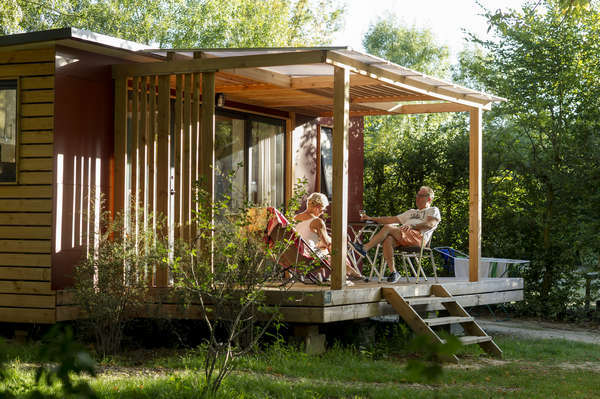 A gentle and sustainable mode of transport, ideal for exploring the great outdoors! If you prefer traditional cycling, our classic models of bike are still available for hire too. 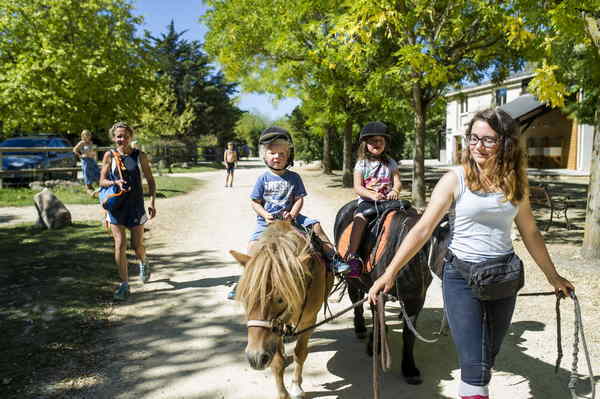 From Mondays to Fridays, your little ones will love going on pony rides around Huttopia Saumur campsite. 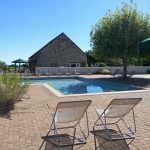 This summer, live like a knight! 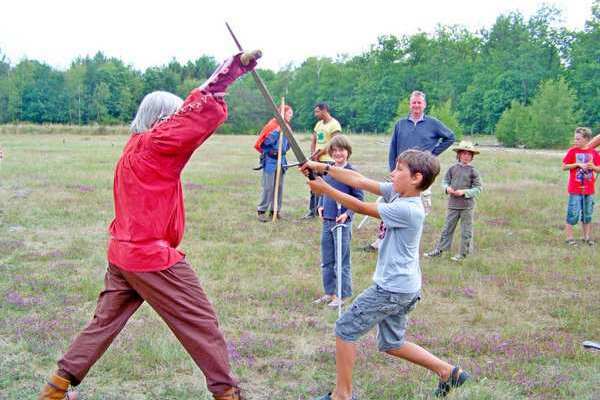 With crossbows and cannon fire, medieval dances and buffets for children and adults alike on Wednesday afternoon. Set out to discover this magnificent region and its many castles. 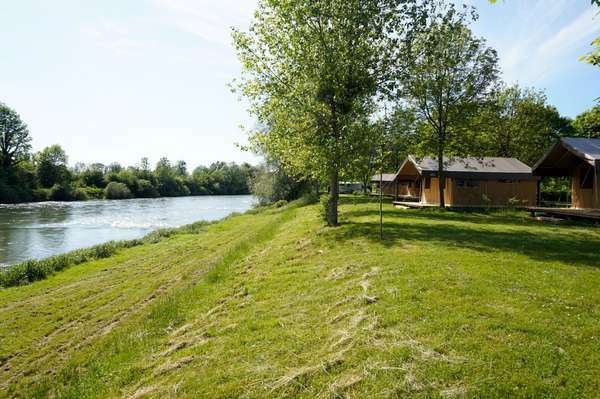 With its breathtaking views over the Loire Valley, Huttopia Saumur campsite enjoys a prime location for discovering this majestic river. 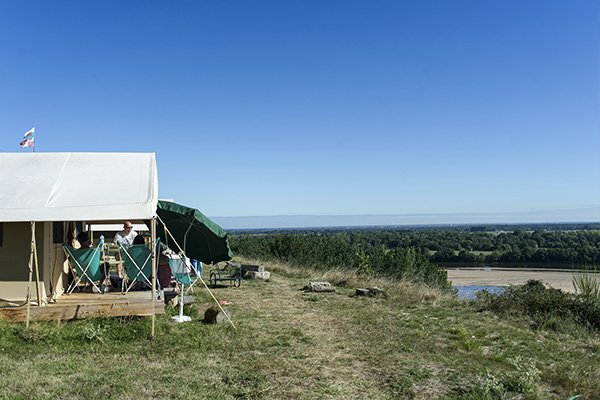 With fishing, bird watching, traditional boat trips, and local wine tasting at sunset on the water’s edge, everyone can enjoy the Loire the way they like best. 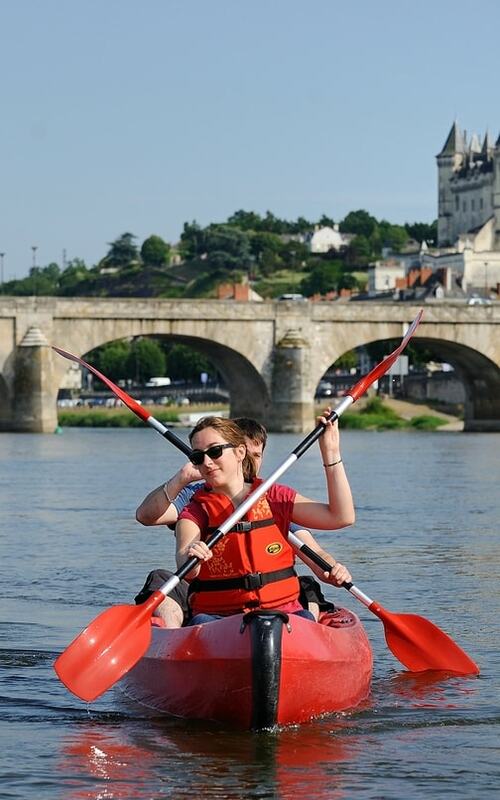 BOAT CRUISES ON THE LOIRE. 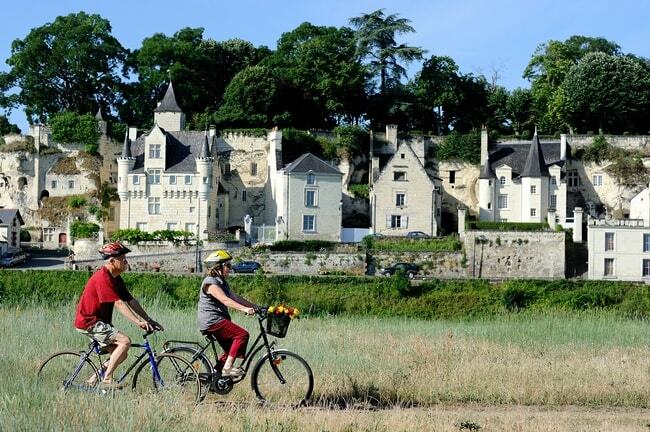 Go on a trip in a traditional boat to discover the Loire with a passionate boatman. 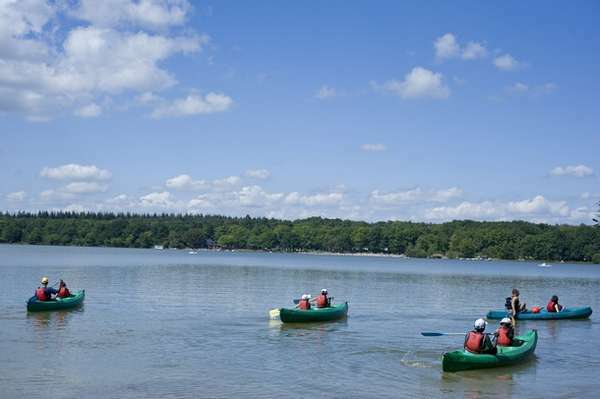 Learn about its history, islands, sand banks, and renowned fish. 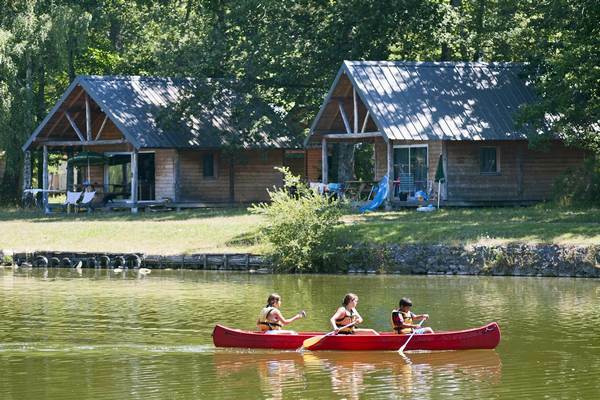 An original way to unravel the mysteries of this extraordinary river. 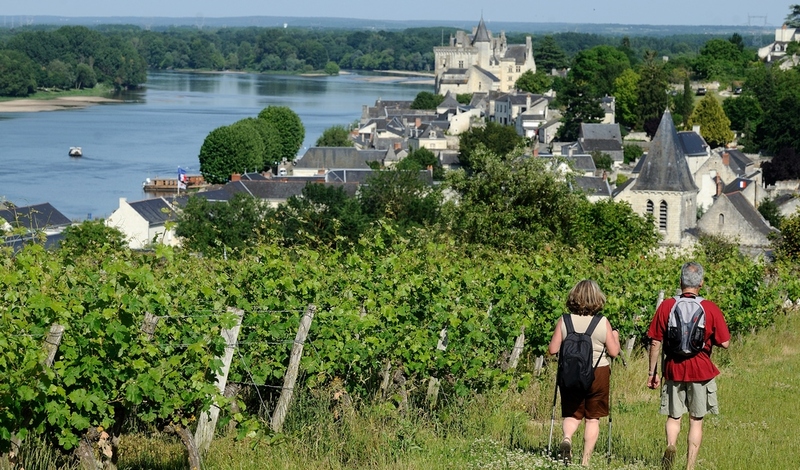 Saumur, in the Loire valley, a region known for its exceptional beauty, castles and wines. 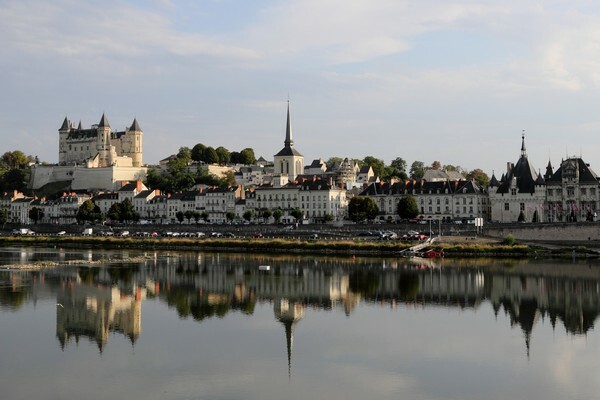 You will also discover the bluish tints of the slate roofs and the golden color of the local limestone that give the villages of Saumur all their charm. 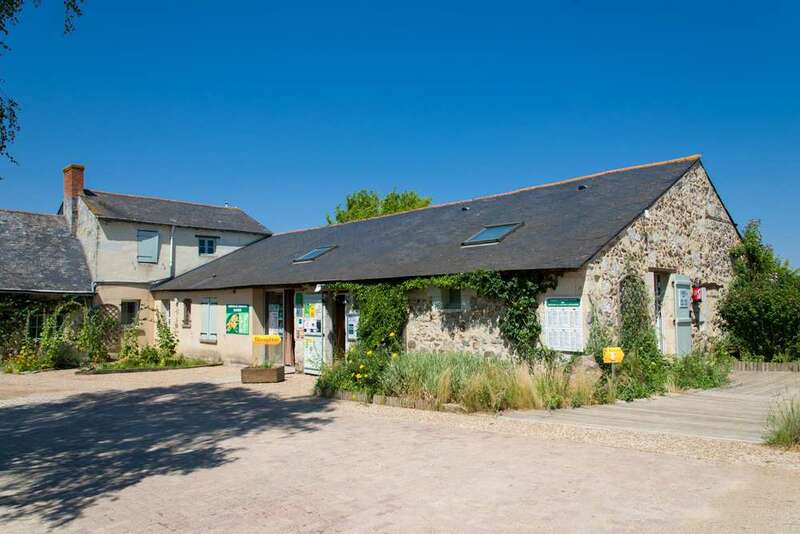 You will also be surprised by the troglodyte houses and the unusual scent of their cellars! 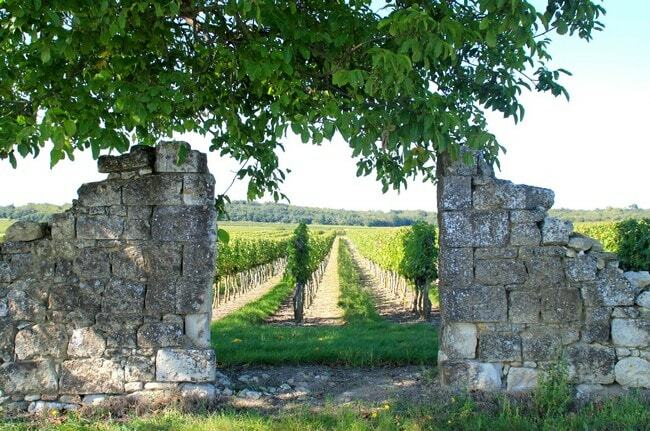 Throughout its history, Saumur has preserved its heritage, especially its culinary traditions (Fouées and pommes tapées…) and its wines, which you can taste at Huttopia Saumur campsite or at one of the wine cellars in the surrounding area, especially at the prestigious wineries of Ackerman and Bouvet Ladubay. 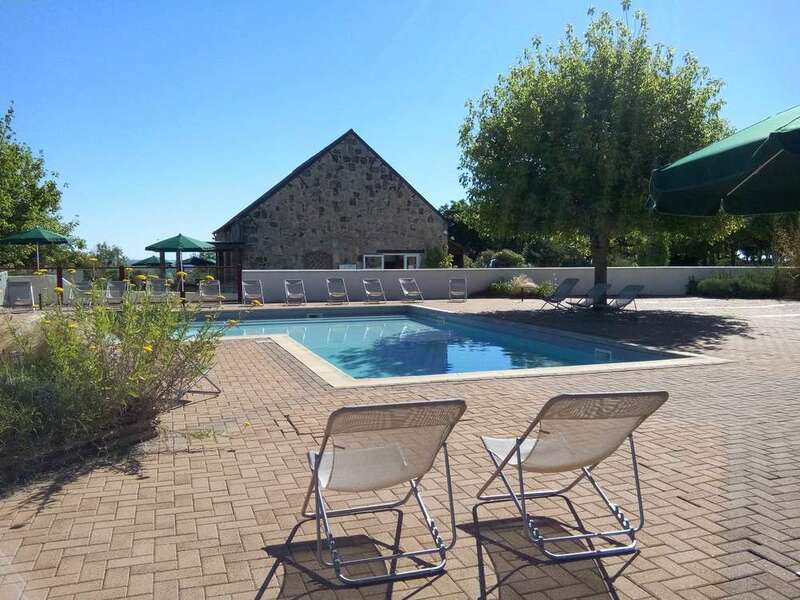 Minimum stay of 1 night. Although the site is well-laid out and large pitches, we were disappointed that neither the bar or pizza was open (low season). However, although a "comfort" pitch, we had no water nearby. Also, there was no lighting during the night. Wifi was dreadful. Friendly staff and good location. 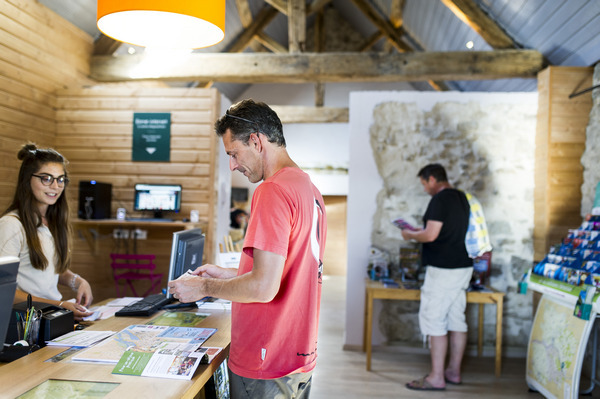 Excellent site with great view, very friendly and helpful staff, hired electric bikes which were excellent. Facilities very good, but in need of some attention - end of season issues I would guess. Not much evidence of maintenance of site pitches either, long grass, weeds, overgrown trees & shrubs - needs a good tidy up. Staff were excellent though.